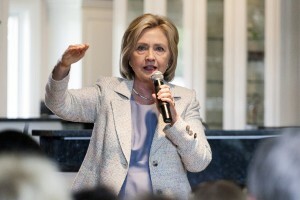 WASHINGTON — Hillary Clinton on Wednesday will unveil a proposal for a new “exit tax” aimed at cracking down on corporate inversions, a practice that permits U.S. companies to merge with corporations overseas to lower their tax bill. Her proposal received the crucial support of Massachusetts Sen. Elizabeth Warren, a progressive leader on fiscal issues who’s remained staunchly neutral in the Democratic primary race. “Secretary Clinton is right to fight back against Republicans trying to sneak Wall Street giveaways into the must-pass government funding bill,” wrote Warren on her Facebook page.